Cooking French lesson for our Kids World Studies International recipes. We are cooking French lessons in this world studies. 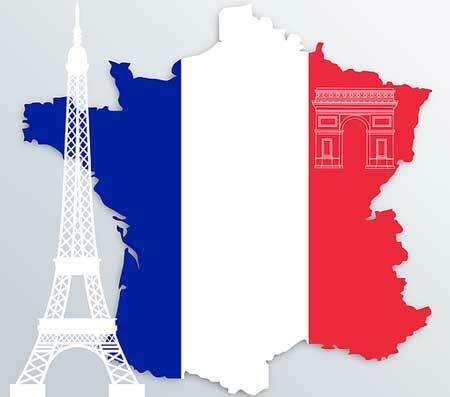 France holds an allure to many people to visit the Eiffel Tower, sit in a cafe and eat fresh hot baguettes. French food is often rich tasting and filling. Cream based sauces are in many dishes such as the Bechamel sauce recipe below. 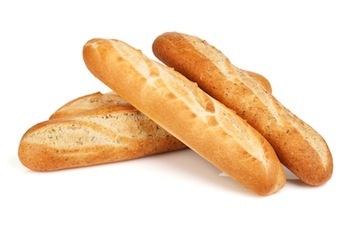 Some key French ingredients may include cream, cheeses, wine, anchovy, tuna, tapenade(olive paste) and fresh homemade bread. Learning how to make bread from scratch is a great way to start a cooking French Lesson as bread is so popular in France. In a large measuring cup or small bowl dissolve yeast in 1 cup warm water and sprinkle in 2 tablespoons sugar. Set aside. In large mixing bowl add 1 cup water, vegetable oil, salt and 2 cups flour. Blend together. Add yeast mixture and remaining 5 cups flour adding one cup at a time. Dough should form into a ball if it is too sticky add ¼-1/2 cup more flour. Place dough on a floured surface and knead. Divide dough in two portions if easier to handle. Knead dough 5-10 minutes until soft and smooth. Pour 1 tablespoon of oil in a large bowl. Add dough and turn the dough over so both sides are oiled. Place plastic wrap or a towel over the top and let rise for 1 hour. Grease a large cookie sheet and sprinkle with cornmeal if desired. Divide dough in half and roll each half out with a rolling pin in the shape of a rectangle. (If you'd like smaller loaves divide dough in portions desired) Roll dough up long ways tightly. Seal edges and with a knife cut diagonal slits on the top. Place on cookie sheet and let rise again 1 hour. Beat one egg and brush the top of the loaves with the beaten egg. Bake at 350 degrees for 15 minutes. 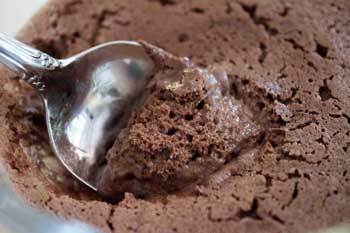 There are many variations of souffles from chocolate to egg to a meat filled souffle. 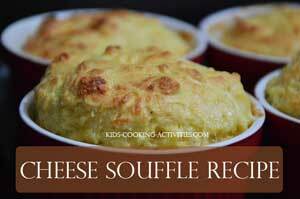 For this cooking French lesson we are making an easy French recipe with a cheese souffle. You can find pictures and step by step directions for a French cheese souffle. 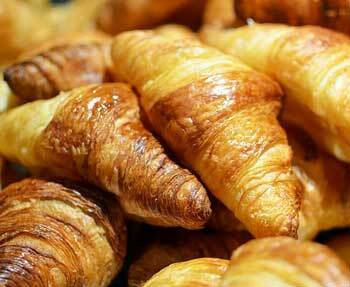 Learn how to make croissants. Crepe is French for "pancake." They are different from traditional thick pancakes as they are thinner, often times have a filling inside and can be rolled up. In mixing bowl lightly beat eggs. Add vanilla, milk, salt, sugar, and flour. Blend together. Stir in baking powder. Let rest for 10 minutes. Heat small fry pan to very hot. Melt butter and spread around to coat pan. Add batter, just enough to cover the bottom of the pan. When it bubbles turn to brown other side. Set aside on a plate. Heat pan again several seconds then pour batter into pan. Stir batter before each crepe. 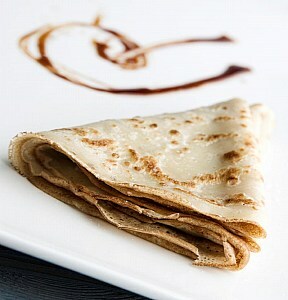 To add to your cooking French lesson visit our crepes kids cooking party for some syrup recipes or filling ideas. An important thing to know about this Cooking French lesson is there are 5 mother sauces. You can learn more about how to make sauces. We will just cover Bechamel in this cooking French lesson. In saucepan melt butter. Add onion, pepper, cloves, bay leaves and garlic. Saute several minutes. Whisk flour into butter mixture. Slowly whisk in milk and stir any lumps out. Bring to a boil then lower heat to low. Simmer for 5-8 minutes. Strain sauce through a strainer with small holes. You want to take all the onion, cloves and bay leaves out of the sauce at this point. Use on pasta, cooked vegetables, lasagna or another easy French recipe. Turn this Bechamel sauce into a Mornay sauce by adding cheese. Stir shredded cheese in your sauce stir until melted. You can use this for homemade macaroni and cheese or on top of homemade pasta. 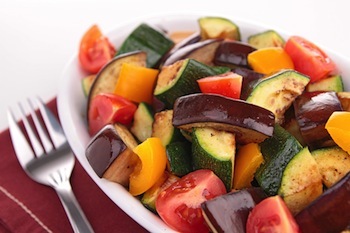 For this cooking French lesson this recipe is loaded with vegetables. You can't get much healthier with this easy French recipe. In skillet pour ¼ cup oil in bottom. Heat oil and add chopped eggplant, zucchini, peppers, onion, and tomatoes. Sprinkle with salt and pepper and stir in garlic. Simmer on medium and cook for 15 minutes or until vegetables are tender. In a large saucepan melt butter and sauté garlic and sliced onions for 5-8 minutes until onions are tender and golden. Add water, bouillon cubes, pepper, salt, bay leaf and Worcestershire sauce to saucepan. Bring to a boil and simmer on low for 25 minutes. 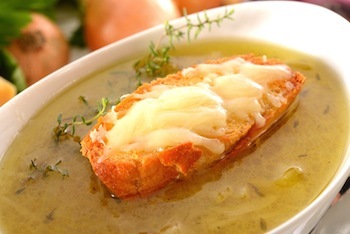 Serve with toasted cheese bread or croutons. Serve warm. If your kids like onions this cooking French lesson would be an easy kids meal. A popular and easy French recipe. This cooking French lesson may be better for older kids to try making themselves. Younger chefs will have to have an adult help with the cooking on the stove. In a saucepan heat heavy cream. Bring just to a boil and take off heat. Set aside. In mixing bowl beat 4 eggs, 8 egg yolks and ½ cup brown sugar. Add a small amount of the hot cream mixture into the mixing bowl and stir together. Then add all of the mixture in the mixing bowl to the remaining hot cream mixture in the saucepan. Stir together and add ½ teaspoon salt and 2 teaspoons vanilla. Stir together and pour into ramekins, small pie plates or one shallow baking dish. Fill a casserole dish with water and place ramekins or pie plates into the water. The ramekins will be covered with water up to about ½ way. (This is called a water bath) Bake at 350 degrees for about 30 minutes or until set. Cool. Sprinkle tops with brown sugar and caramelize in the oven before serving. You can also serve with fresh fruit. Chop chocolate with a knife or place in ziploc bag and use a rolling pin or kitchen mallet to crush. Whip whipping cream in a mixer for several minutes until stiff. Chill in the fridge. Meanwhile, melt chocolate pieces, water and butter in saucepan. Stir until melted and smooth. Let cool. In clean saucepan add egg yolks, sugar and another ¼ Cup water. Whisk together and cook over medium heat. Use a candy thermometer and continue stirring until temperature reaches 160 degrees. Turn off stove and set pan aside. Whisk chocolate mixture into egg yolk mixture. Allow to cool, stirring often. Stir in whipped whipping cream. Spoon into serving dishes and chill until serving. A yummy cooking French lesson. Take me to another International recipe page from Cooking French lesson, Asian Cooking.